http://markandpaigerodriguez.blogspo...d-bad-and.html Our thoughts on this episode. It was pretty good I have to say, possibly the best fights between Raph and Casey we've ever seen animated. And the Foot were actually a threat. No wonder Shredder replaced the useless human Foot with the more superior robot models. I don't know why, but that fight on the train reminds me of the matrix or the Wolverine. So yeah um that's got to be my favorite episode so far. Full of turn-up-ment. Too much good stuff to list it all. Favorite part was the movie reference. Hmm, I wonder how they'll fit derp April in the next episode. Probably nothing much, the episode will probably end on a cliffhanger showing a normal April clone has been completed. And something will happen to it in a later episode. 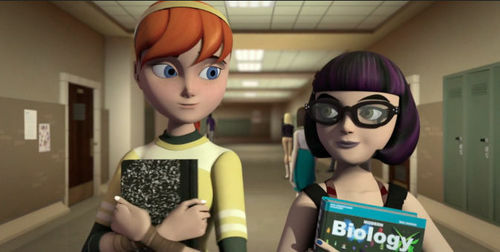 It was nice to see this Irma, now with purple hair and perhaps a bit younger than April (Biology tends to be a sophomore year class, not to mention she's shorter). 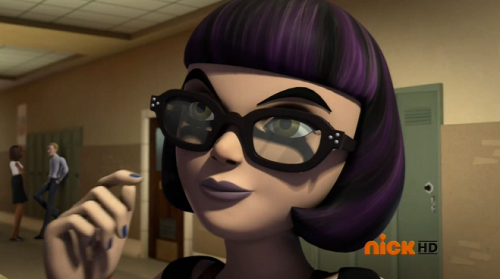 Irma has a different personality- more bookish and intelligent kinda type I guess. She also seems intimidating and not boy hungry lol. Overall, I can get by with the change. Loving it. 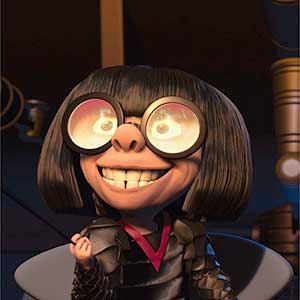 Kinda reminds me of Edna Mode for some reason. Did we all notice generic blonde lady in the corridor. I'm pretty sure the guy in the blue shirt was in the office that Baxter Stockman attacked in his robot of doom. SO WHAT'S HE DOING IN A HIGH SCHOOL? Did they say Irma's last name at all in the episode? I haven't seen it yet. Except for a few, few small things this episode was perfect. There was some really great nods to past meet ups from Casey and Raph. The training session in #2, the roof top spotting from the movie and a few other great nuggets. One thing that really stood out for me was the soundtrack for this episode. It felt more epic and nuanced (Not that the others haven't). There was a part of me that was wondering if the guitar rift that came in with Casey was a nod back to the 1989 movie? Great episode! 9/10 for me. Casey did say he has a sister though I doubt Irma will be it but it would have been interesting if they were related....maybe cousins or something. The train fight did remind me of the train fight in the Wolverine movie a lot. 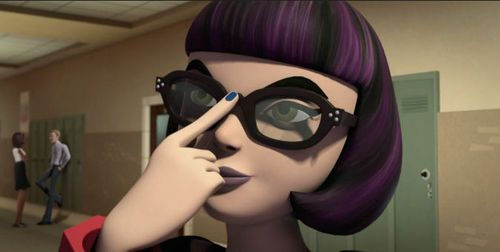 Also does anyone remember what Irma's last name was in OS Turtles? I'm probably the only one who didn't like this very much. As much as I love this new show I'm just not a fan of this kid Casey. It just all seemed to happen to fast for me with Raph and Casey just meeting and becoming the best of friends. Yet when they met Tim they treated him like total crap. I have to wonder if the lair is compromised now though since Casey lead the Foot to it. That was the only thing I think I liked about the episode. I know a lot of you like nonstop action but I like a bit of story to go along with it and I felt it wasn't really there this time. I also find it really hard to believe Casey could take out the Purple Dragons and fight Raphael so well. Plus I just want to say I feel like they've really dumbed down Mikey which every show seems to do at some point or another. Oh I almost forgot to mention Irma, not as cute or funny as the clumsy old toon version but the voice did sound a bit like the 80's version which I thought was cool. Here's to hoping I enjoy next weeks episode better with the big April secret! I give this episode a 3 out of 5. Everything says it was Langinstein (which is why I don't buy IGN's review as canon if it wasn't said in-show). I don't remember it ever being mentioned in OT, but reportedly it was. According to IMDB Irma's last name was Langinstein in the OT. Again, NOT REMOTELY a source that we can use. I'm so proud of Donnie for not letting his love for April make him instantly mean to Casey when April introduced them. I was expecting a frown....but no, he actually smiled XD I'm so happy! !